Vcasmo is another online presentation software that is designed for those who want to create, discover and share professional presentations. It is completely free to use solution and comes with easy to use interactive interface where you can get all the feature content. Just like most of the online presentation solutions it also comes with a massive range of presentations templates, and all the templates are consists of multiple categories. authorSTREAM is a free to use platform for sharing PowerPoint, Keynote and PDF presentation on the internet. It makes it easy to share your slideshows through website, blogs, YouTube or even via iPod. This online presentation platform has a massive range of unique presentations that consist of multiple categories such as Fashion, Sports, News, Business, and Home, etc. Zentation is an online solution that combines PowerPoint presentation and YouTube video for your next presentation. It is a comprehensive solution that helps you combine these tools into the one dynamic presentation with slides and the video showing side by side. This new presentation method can share the live presenter and slide together on the screen. Present.me is an online solution that lets you create effective presentations through your PowerPoint files. It works similar to like all the other online presentation solutions but offers lots of new features, tools, and services that make it better than others. The best thing about this application is that it allows you to record a narrative through your microphone and webcam as if you were presenting the slideshow. Projeqt is a new kind of presentation software that comes with new slideshow format and some new exciting features that increase your work speed and make a stunning content. It is free to use and still offers a more creative platform to present your new ideas than PowerPoint. 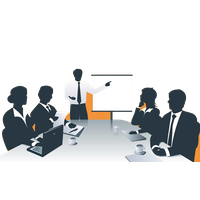 The best thing about this presentation platform is that it allows users to drop into the series of sub-presentations. SlideSnack is a web-based application that simplifies the way you create professional content. It is an online PowerPoint like Presentation software that comes with some new features and tools. The application makes it quite simple to record and add voice to the presentation. With this, you can also able to uploads files in different formats and easily customize it to your perfect slideshow after finalizing your work you can easily. PowerPoint Online is a web-based animated presentation solution created by Microsoft. It can be used for business, academic and personal reasons. This online version comes with all the major features and tools in order to deliver a complete and comprehensive solution. With this, presenters can easily access its online library, OneDrive and other cloud solutions that it better than others. Zoho Show is a browser-based presentation tool that comes with a real-time collaboration feature. The application allows users to customize their presentations with text, images, charts, and videos. It supports the import and export of files and also allow tor read slides in various formats as well as save them to the PC in different formats. SlideServe is a free web-based solution to share PPT and PDF files. This online platform has millions of PDF presentations that consist of numbers of categories such as fashion, games, sports, news, science, applications, home, and businesses, etc. Each presentation has its own layout, images and color scheme. It also allows you to upload your own presentations without any limitation and get real-time feedback to improve your skills.